In this article Mr. H. J. Penrose, who, incidentally, is chief test pilot to Westland Aircraft ДальшеMore>>> Ltd., describes how he set out to design and build a small sailplane which would have a good performance and outstanding characteristics in the matter of portability. ALTHOUGH the Pegasus was finished only early this year, the original design and stress-work was commenced in September, 1932, and construction a few months afterwards. Originally it was optimistically expected to finish the machine in six months, but there were many unavoidable delays, apart from the fact that everything took much longer than was anticipated and despite the considerable help which the designer received from his wife and many members of Westland Aircraft, Ltd. 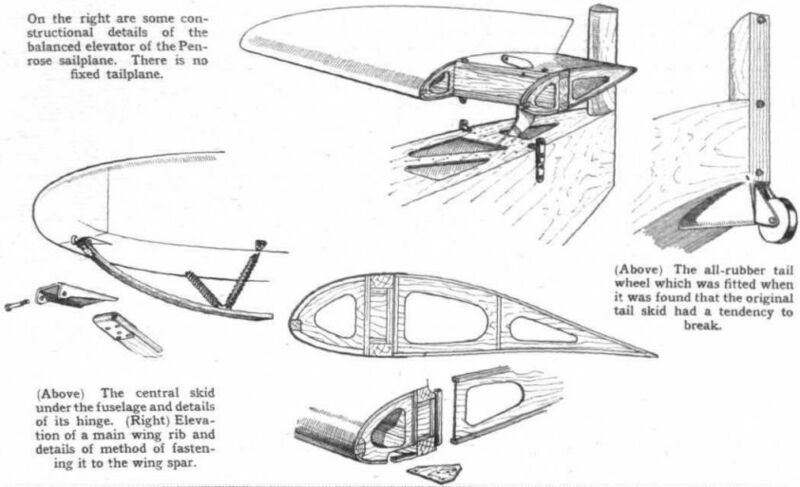 In the dark ages of 1931-32 it had been forcibly brought home to the designer that there was much too much heaving and pulling and all too little gliding, and this was attributable in part to the great weight and size of the conventional sailplane. An investigation of different types showed that it should be quite possible to realise a very satisfactory performance from a machine having a good value of span2/area and a considerably greater loading than those then current. Other requirements were then taken into consideration, such as portability, controllability, small size for transport, etc., and ideas gradually clarified into the Pegasus. Happily, its pilot was not of great size, and weighed 10 stone, and this, of course, facilitated the design. In view of the fact that the machine was to be home-made, both from the point of view of interest and of cost, it was found vital to make each structural unit of very short length, as, in order to get them out of the workshop, one had to negotiate a bend of just over 12 ft. 6 in. In addition, every part had to be of the simplest possible construction compatible with lightness. Concurrently with the original investigation, the Cloudcraft Sailplane Co. was working on a similar project, and at one time the Pegasus was almost abandoned for Mr. Dickson's Junior. 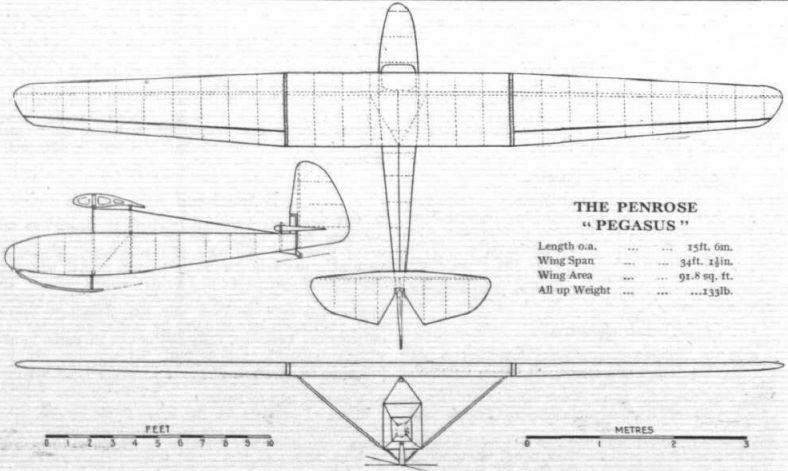 The ply-covered fuselage of the Pegasus was made 12ft. 6in. long and built up on spruce longerons and four main bulkheads, with a number of stiffeners, and light intermediate bulkheads. A rectangular box-section was adopted to avoid the difficulty of bevelling longerons and making vee bottoms and decks. The top of the fuselage has a deep vee fairing of fabric on a stringer and a number of formers. To obtain adequate ground clearance the ash skid was sprung by two relatively long telescopic members - actually obsolete Widgeon tail-skid members - and these formed a vee in front view; this, it was hoped, would enable the machine to stand up to drift landings with little damage. As a further precaution against side drift loads the fuselage attachment plates for the spring legs were made separate from the main lift-strut plates, which are also fitted at the same point on the fuselage. In practice this skid undercarriage has been found to work extraordinarily well. The usual single-spar type of wing was adopted having a modified Gottingen 535 section, with a plan which was considered the optimum for the design. With a view to good controllability, long, narrow-chord ailerons were fitted, having a heavy differential. The difficulty and trouble of making a large number of jigs for the ribs of the tapered wing was overcome by adopting a suitably lightened three-ply web construction instead of the normal girder. Each web was drawn out full scale and cut to shape, and a second web for the opposite wing made by tracing off the first. Grooved flanges were then slipped over the profile of the rib, bent round by hand, and glued in place; the finished rib, which went to the full depth of the section, proved both light and strong. Ribs were afterwards cut in two at the spar juncture and secured to the spar by chocks. The three-ply leading edge was glued to each rib, and, of course, made a further and very strong attachment, whilst horizontal gussets further stiffened the attachment of the rear half. The spar itself consisted of two relatively heavy flanges of spruce with a three-ply web at the rear and stiffened with diaphragms. Because of the small workshop and to facilitate transport, the wing was made in three parts, attached together by the usual system of plates and horizontal pins. Strut bracing was adopted, as this gave a lighter structure, and, it was considered, would stiffen the structure against handling and landing loads. All internal woodwork was varnished, and the structure completely covered with aircraft fabric, instead of adopting the more usual method of gluing the fabric to the end of the nose-box and varnishing the leading edge. The fabric was sewn to each rib. The floating tail and the rudder (of ample area) were of similar construction to the main planes, and these units were slightly balanced. The horizontal surface was mounted very simply and quite effectively by eye-bolts passing vertically through the spar and pinning the eye to a plate bolted to a sturdy bulkhead. Tests with the machine have proved it to be more successful than anticipated, the only trouble so far experienced being broken main and tail skids. The former trouble has been overcome with a stiffer skid, and the latter by fitting a small all-rubber (and therefore shock-absorbing) tail-wheel. Controls have been found most effective, and the machine is extremely manoeuvrable, as might be anticipated from its small inertia. Turns can be carried out on ailerons alone. At Sutton Bank the Pegasus behaved very well, despite the fact that it was the pilot's first experience of soaring; although loaded to 3 lb./sq. ft., the sailplane seemed to have a good speed range and was able to fly as slowly as machines having less loading. The handling party were full of praise, because two energetic men could carry the machine. Although B.G.A. load factors were in general exceeded in the design, the all-up weight was found to be only 133 lb., or 3 lb. more than calculated. The area is 91.8 sq. ft., and the loading 3 lb./sq. ft. The sinking speed is alleged to be 2.7 it./sec with an L/D of 1 in 20.5. Top: Some constructional details of the balanced elevator of the Penrose sailplane. There is no fixed tailplane. Left: The central skid under the fuselage and details of its hinge. Right: The all-rubber tail wheel which was fitted when it was found that the original tail skid had a tendency to break. Bottom: Elevation of a main wing rib and details of method of fastening it to the wing spar.